“Glasgow Montrose got off to a winning start in the Dunbarton league beating last year’s runners up Bearsden 2.5 – 1.5. The choir in the background were in full voice but it was the home team who seemed ultimately to be out of tune. “GM Board one, Robin Templeton with white was all at sea in the opening with 2100 rated M. Redman looking to land a quick KO. It is not often a player of this calibre misses the win of a piece but that is what happened. The ending petered out to a draw after exchanges with White having K+R and Black K+N+P. On Board two Bahloul and Bucher ended up castled on opposite sides. Pawns started pouring forward as each player went for the throat. When the dust settled Bahloul was unlucky to find his king position a shade bare and this cost the game. 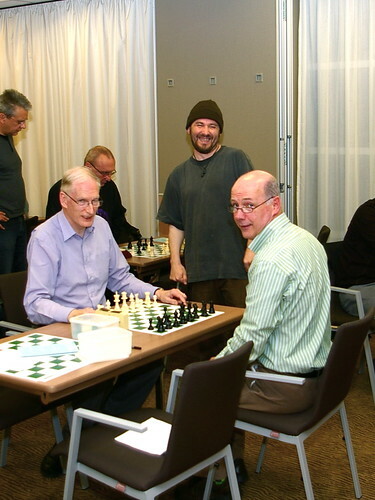 Norman Lindsay played a careful game against Mel Burt – steadily increasing his advantage before winning game and match for GM. Most impressive was Nicolas Guirkinger at Board 4 who notched GM’s first point of the night against Tom Borland. Coming out of the opening two pawns up and coasting Nicolas then allowed some counterplay before the connected pawns settled the game. The ‘B’ Team’s away fixture against Bellshill ‘A’, originally scheduled for tonight, has been postponed until 18th April. A glorious mating combination by Chris Perkin saved the ‘B’ team from a wipeout in tonight’s Glasgow League Div. 2 fixture against the ‘A’ team. The 2010-2011 season kicks off in earnest tonight* with a Glasgow League Division 2 fixture between Glasgow Montrose ‘A’ and ‘B’ teams at the club premises at the Novotel. High jinks at the Novotel on 30th Sep.